For many people, Mexican food means tacos and enchiladas. But, as Chef on a Shoestring, Scott Linquist dropped by The Saturday Early Show to remind everyone that Mexican cuisine is much more diverse. The flavors of Mexico can be used to spice up any number of dishes. Linquist, who heads the kitchen at Dos Caminos restaurant in New York City, prepared a three-course meal for four on the Shoestring budget of $40. Linquist was born and raised in Los Angeles, where he had access to great, flavorful Mexican food. A graduate of the Culinary Institute of America, Linquist has worked at Boulevard in San Francisco, and Lutece and Gotham, both in New York City. Eventually, he returned to California to cook Mexican-influenced food at the Border Grill. He took a short break from the restaurant business to teach at the California School of Culinary Arts. But he says he realized that although he enjoyed teaching, he really missed working in a kitchen. Steven Hanson tapped Linquist to open Dos Caminos in 2002. Dos Caminos is part of the B.R. Guest Corp., which also runs Blue Fin, and Fiamma. Linquist opened the third Dos Caminos in New York City last fall, and he's preparing to open one in Vegas. He is also finishing his first cookbook, focusing on Mexican-influenced recipes. Linquist and his wife live in New York City. Watercress: This green has small crisp leaves and a slightly bitter flavor. It's available year-round and is customarily sold in small bouquets. You can use watercress in salads, sandwiches, soups and other dishes. Jicama: Most people have probably had this vegetable before and don't even know it. Once peeled and sliced, it's white and has very little taste. It's crispy and is often served in Mexican-inspired salads or as a garnish. Beef Short Ribs: Rectangles of beef about 2 inches by 3 inches, usually taken from the chuck cut. Short ribs have layers of fat and meat, and contain pieces of the rib bone. They're very tough and require long, slow, moist cooking. 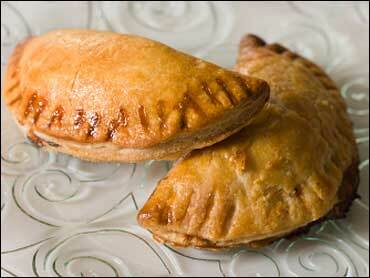 Empanadas: Empanar is Spanish for "to bake in pastry." Empanadas are usually single-serving turnovers with a pastry crust and meat filling. But they can also be filled with fruit and served as dessert. Please note that all recipes below serve 6. For the purposes of Chef on a Shoestring, the recipes were cut to serve 4 and priced accordingly. In a pinch, this is a stylish, light salad that can be put together quickly. The bitterness of the watercress is balanced with the sweetness of the mango and the creamy nuttiness of the dressing. Jicama is a root vegetable also called "Mexican potato" that looks like a large round potato, but it has a mild, sweet taste with a crunchy white interior that is similar in texture to an apple. Heat a toaster oven to 350 degrees. In a small bowl, toss the pumpkin seeds with 1 tablespoon of the olive oil, add the chile powder and 1 teaspoon of salt, toss, and spread in a thin layer on the baking pan of the toaster over. Bake for 7 to 10 minutes, stirring once or twice until nicely colored. Remove and let cool. In the jar of an electric blender, combine the poblano chile, garlic, vinegar, lime juice, and 1/4 cup of the pumpkin seeds and purée until smooth. With the motor running on medium speed, slowly pour in the remaining 1/4 cup olive oil and the canola oil and blend until emulsified. Season to taste with salt and pepper and chill. In a medium-size bowl, combine the watercress, jicama, mango and orange segments with about 1 cup of the dressing, or enough to coat the ingredients, and toss gently. Serve about 2 cups of the salad in the center of each plate. Garnish with the remaining toasted pumpkin seeds and a sprinkle of chile powder. For Mexican-style comfort food, few dishes come close to fork-tender beef short ribs braised in a red chile broth made with ancho, guajillo, and arbol chiles. Linquist likes to serve it with some roasted potatoes and other root vegetables. Prepare the Tres Chiles Salsa. Preheat the oven to 350 degrees. Season the short ribs on all sides with salt and pepper. Heat a large, oven safe pan over high heat on top of the stove. Add the canola oil and sear the short ribs on all sides until browned, about 2 minutes per side. Stir in the Tres Chiles Salsa and simmer for 5 minutes. Add 4 cups of the chicken stock, the oregano, and the bay leaf and season to taste with salt and pepper. Bring the liquid to a boil, cover the pot, and transfer to the oven for 1 1/2 hours, or until the meat is very tender, adding more stock if needed to cover the meat. Blanch vegetables separately until tender, let dry. Heat an oven proof skillet, add olive oil and cook on the stove until vegetables begin to brown and then place the skillet in the oven for 7 minutes stirring occasionally until vegetables are evenly browned on all sides. Remove the short ribs from the cooking liquid and strain the broth into a clean pot. Bring to a boil and reduce by a third, skimming to remove the fat from the surface. Return the short ribs to the broth, add the roasted vegetables and keep warm. Toss the cabbage with the lime juice and season to taste with salt. Divide short ribs among six large, warm pasta bowls. Ladle 1 cup of the red chile broth over the meat, garnish with 1/4 cup shaved cabbage and a sprinkle of cotija cheese, and serve with warm tortillas. These are three of the most common dried Mexican chiles which can be found in the Mexican section in the market or gourmet shop. If all three chiles are not available, use all guajillo or all ancho chiles. Toss tomatoes, garlic and onion in 2 tablespoons olive oil and season with salt and pepper, lay them out on a baking sheet and place in a 400 degree oven for 15 minutes until brown and tender. In a medium saucepan, cover the cleaned chiles with about 4 cups of water, bring to a simmer, then remove and let cool. Reserve the cooking liquid. In the jar of an electric blender, combine roasted vegetables with the chiles, 2 cups of the cooking liquid, salt, and pepper and purée until smooth. Reserve. In a large heavy skillet, melt the butter over medium-high heat. Add the apples, 1/2 cup of the sugar, 1/2 teaspoon of the cinnamon, the salt, and both raisins and cook until the apples are caramelized and soft, 5 to 7 minutes, stirring occasionally. Remove from the heat and cool. In a large bowl, using a handheld mixer or whisk, beat the cream cheese on low speed until soft. Add another 1/2 cup of sugar and 1/2 teaspoon of cinnamon and mix just to incorporate. Add the mascarpone and mix just to blend. Do not over mix. When the apple mixture is cool, fold it into the cream cheese mixture and chill for 30 minutes. Dust a flat workspace with flour. Using a lightly floured rolling pin, roll out the puff pastry to a thickness of 1/4-inch. Using a plate or cardboard template measuring 5 inches in diameter and a sharp paring knife, cut out six pastry circles. Brush the disks lightly with the egg wash, spoon 1/4 cup of the filling in the center, fold in half, and seal by pressing the tines of a fork perpendicular to the edge. Lay the empanadas on the pan. Combine the remaining 1/4 cup of sugar and 1/4 teaspoon cinnamon in a small bowl. Brush the empanadas with the egg wash and sprinkle a little cinnamon sugar on top. Bake in the center of the oven for 8 minutes, turn the pan back to front, and bake for 8 more minutes, or until light golden color. Remove from the oven and transfer to a rack to cool. Sprinkle the empanadas with a little confectioners' sugar and serve with a scoop of vanilla ice cream, if desired.